Thank you for taking a moment to learn about the broad collection of accurate, easy-to-use statistics and graphics tools available in NCSS. Since 1981, we have been fine-tuning these tools for analyzing data in all major research areas. NCSS has many tools for comparing means: from T-Tests and analysis of variance, to non-parametric tests and Longitudinal Mixed Models. If you are doing regression analysis, NCSS has a full array of sophisticated regression procedures, including Logistic, Cox, Ridge, and nonlinear regression. NCSS also has excellent tools for comparing proportions, such as Fisher’s exact test, and sensitivity and specificity analysis. Looking to do survival or reliability analysis? We have you covered. A wide variety of multivariate analysis tools is also included. With over 200 tools, NCSS truly is a comprehensive statistical package that will allow you to analyze your data quickly and effectively. We have put a great deal of effort into finding the most accurate algorithms available. NCSS has been extensively verified using published books and reference articles. 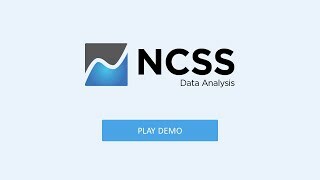 As for the visual representation of your data, NCSS has a wide range of powerful graphics tools, including scatter plots, histograms, bar charts, error bar plots, and survival curves. These visualization tools have been carefully refined to give complete control of all aspects of the graph, while maintaining an easy-to-use and intuitive design. The result is a plot that describes your data in a way that is elegant and compelling. And the attributes of the plot can be specified with or without the integrated data. These graphics can be saved in a variety of file formats or easily copied and pasted into your document or presentation. The data window makes viewing, importing, or transforming your data a simple task. NCSS will import or export Excel™, Access™, text files, or even other statistics program formats. All reports are displayed using a built-in word processor with an easy navigation pane. You can quickly view, edit, save, copy, paste, and print your output. NCSS comes with complete documentation that contains tutorials, examples, annotated output, references, formulas, and complete instructions on each procedure. Find out what many others have seen as they have used NCSS. We are confident you will agree that NCSS is accurate, comprehensive, and the easiest-to-use data analysis and graphics program available. And if you have any questions, our team of PhD statisticians will be happy to assist you. To purchase NCSS or to obtain a free trial, go to ncss.com.